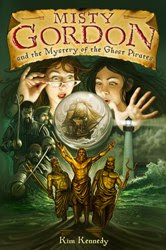 Misty Gordon and the Mystery of the Ghost Pirates by Kim Kennedy, is a very good book. At first when I saw the book cover (and this might happen to you) I got very confused. The first things you see on the cover of this book are two girls (one in cat-eye glasses), a crystal ball (with a pirate ship in it), little golden statues of the "Big Three" (Zeus, Poseidon, and Hades), a group of (ghost) pirates, and a lighthouse (super high-tech, but it doesn't matter when you're starting the book). As you read the book all of the things on the cover begin to make sense. I think people in 4th-6th grade will like this book (I read it in 5th grade). I think they will like it because it has an interesting plot. Though, younger kids wouldn't like it because they wouldn't be able to follow the plot, as it is a bit confusing. Also, older people might think it is too childish, but if you're like anybody in my family you will have a wonderful time reading this book!